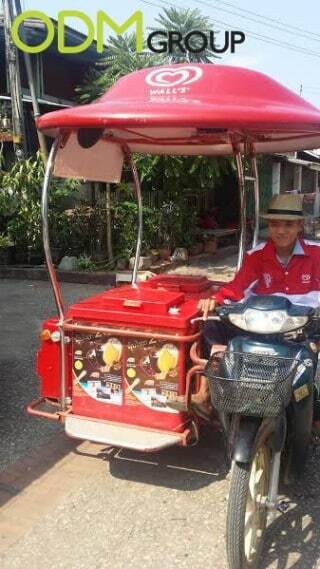 While ice-cream trucks are a common sight in the West, you will find motorcycle vendors a familiar sight in Southeast Asia. In a recent sighting by our ODM staff, we found a massive branding opportunity idea. 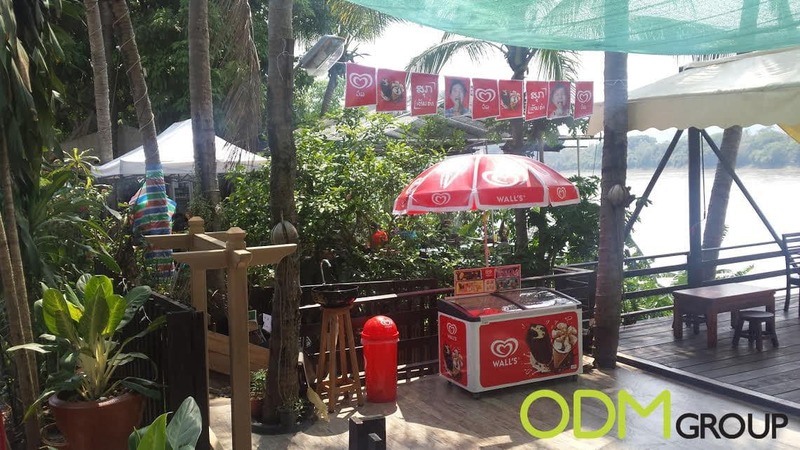 This opportunity, which was spotted in Laos included a variety of branded merchandise. Below are some pictures of Wall’s brand marketing sighted in Luang Prabang. From the picture above, we can easily spot Wall’s logo on the freezer and bin. Such an eye catching color and design will definitely attract passers by and grab consumers attention. The company utilizes the large surface area by printing it’s logo on the merchandise. The popping color used for the product is wisely utilized to ensure interaction among consumers. In addition to the eye catching freezers, we spotted bike riders wearing Fedora hats that are incredibly popular right now! Having a customized Fedora hat with the company logo is an immense brand marketing opportunity! We would recommend Wall’s to give out the Fedora hats as uniform to their vendors. This will significantly increase brand visibility and establish presence when outdoors. What do you need to know about branding? Brands are valuable, as they can outlive products. A brand holds a certain promise to consumers in delivering consistency such as quality, experience and credibility. Branding is fundamental and essential for a company in creating value for a lifetime. It is important to set your brand apart from competitors. Think about brands you purchase from, such as Coca-cola and McDonald’s. Is their physical assets much more valuable than their brand? Absolutely not. Strong branding strategy will create everlasting value which outlives physical values. Why is visual merchandise so important for your brand? Visual merchandising strategy plays a prominent role in brand marketing and advertising. Examples of visual merchandising are store appearances, signage, uniforms and point of sale displays. Having branded merchandise either on a display or uniform can help create images of products in the customer’s mind. Images such as the company color, logo, packaging and display of a product that will evoke certain emotions. 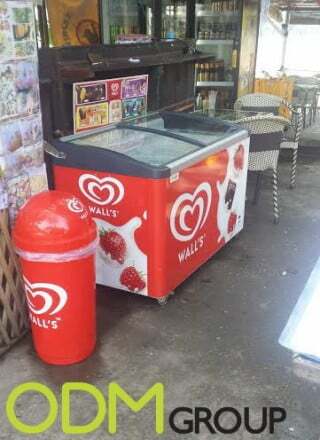 Using Wall’s ice-cream as an example, the visuals of Wall’s logo and color acts as a stimulus in enticing customers. Thus resulting in customers walking to your doorstep and making impulse purchases. Why use branded Umbrellas as part of your marketing merchandise campaign? Branded umbrellas have a large branding area as well, which is a fantastic opportunity for high visibility and brand exposure. There are many designs that you can use for the branded furniture. It can be seen as an advertising platform as shown in the picture above. The umbrella can act as a billboard by printing logos and slogans on the canvas. It is ideal for brand marketing and as functional furniture. Why use branded banners for your brand? Branded banner is another cost effective way in advertising and marketing. Your company can take advantage of the low cost printing from manufacturing in China. This physical banner can be reused several times for your marketing campaign. You can learn more about banner printing clicking here. How do branded corporate uniform and visual merchandise works in brand marketing? A uniform brings positive effect to your brand image as your staff shares a sense of camaraderie. It’s visual appeal with your company logo will exude a presence of authority, responsibility and professionalism. For example, Fedora hat acting as a uniform will help the wearer to stand out in the general public. It is a symbolic piece of accessory customers can easily identified with when looking at it. They will be conditioned to look for the hat and logo in associating past experiences with your brand. The hat is also ideal in shielding the sunlight for outdoor occasions and making the wearer look good. In addition, it will bring tremendous benefits such as brand recognition for your company. Why does the Fedora hat make an excellent choice for marketing your brand? The Fedora hat is a low cost product which can help to maximize advertising and brand marketing opportunities. We can customize the hat to use different colors, designs, symbols and of course, branding. The materials can also be customized, such as wool, silk, leather and straw – the material can change the product from a cheap gift to a high-end product. The brims can be altered to create a stylish and unique look. The large surface area is suitable for printing logos and wordings. Furthermore, it enables one to stand out in the local environment where customers are conditioned to look for the hat. You can find out more about the Fedora hats and other branded merchandise promotion by clicking on the links below. You will find interesting ideas and gifts by visiting our other blogs. We will be happy to assist you and answering all your questions. Branded cabana pillows – great idea for your next promo campaign!